Russia has been using its natural gas exports, prices, and contracts as a tool of hybrid warfare against Ukraine and other former Soviet republics for decades. Another episode of the Russia-Ukraine gas war unfolded two weeks ago. Unlike the previous attacks, this time it was a “blitzkrieg”: Ukraine won, and Russia’s blackmail failed. Is the EU risking to have all Russian gas supplies cut off? On 28 February Ukraine’s state natural gas company Naftogaz won in an epic four-year legal battle against the Russian gas giant Gazprom in the Stockholm arbitration tribunal. Overnight into 1 March, Gazprom refused to supply prepaid gas to Ukraine, moreover, it lowered the pressure of the transit gas being supplied to the EU. The Cabinet enacted its energy crisis response action plan, instructed power generating companies to switch from natural gas to boiler oil, recommended all academic institutions, from kindergartens to universities, to completely suspend work until 6 March. Naftogaz signed an urgent contract with Poland’s company PGNiG arrange alternative supplies. On 3 March, Naftogaz said that Ukrainians had managed to cut consumption by 14%. Gazprom announced that the company launched procedures in the Stockholm international arbitration court to terminate its supply contracts with Naftogaz. The U.S. urged Russia not use gas as a political weapon against Ukraine. On 5 March, Naftogaz announced that it would close its representative office in Russia by 12 March 2018. Naftogaz demanded compensation from Gazprom for gas imports from EU amid the brief energy crisis. Gazprom officially informed Naftogaz of the beginning of proceedings through the Arbitration Institute of the Stockholm Chamber of Commerce on the termination of gas contracts. Why did Russia cut off the gas? It was Russia’s revenge for the victory of Naftogaz over Gazprom in the Stockholm arbitration court. Cutting the gas off, Gazprom acted as a political leverage of the Russian authorities. What was this Stockholm legal battle all about? It was about two contracts between Gazprom and Naftogaz made back in 2009: one related to the terms of Gazprom’s supply of gas to Ukraine, and the second about the transit of Russian gas to the EU through Ukraine. The gas supply contract. In 2014, Gazprom cut off the gas supply to Ukraine, amid the unfolding Russian invasion in the Donbas, an eastern Ukrainian region. Gazprom claimed that Naftogaz had violated the 10-year “take-or-pay” gas contract of 2009, which was signed amid the Russian-orchestrated gas crisis in the EU. Under the contract, Ukraine had to pay for more than 50 billion m³ (billion cubic meters, bcm) of natural gas annually whether it was consumed or not – over 1/3 more than it needed after the Ukrainian economy took a dive following the Russian-inspired war in eastern Ukraine. Moreover, as Russia occupied Crimea in 2014, Russia denounced the 30%-gas-discount Kharkiv Pact granted for extending Russia’s lease of a naval base in Crimea, increasing gas prices for Ukraine. The transit contract. At the same time, Naftogaz accused Gazprom of infringing a transit contract, saying that it under-delivered the contracted 110 bcm/year via Ukraine to the EU. Plus, Naftogaz considered the 2011-2015 prices and “take-or-pay” volumes not appropriate. In the fall of 2014, both sides filed lawsuits to the Stockholm Court of Arbitration. In 2018, Ukraine won. It is. This is the first time Ukraine beat the Russian monopolist in a European court. Gazprom got used to dictating its terms to Ukraine under pressure of Russian gas blackmail for decades and it’s a great blow to Russia’s ego. 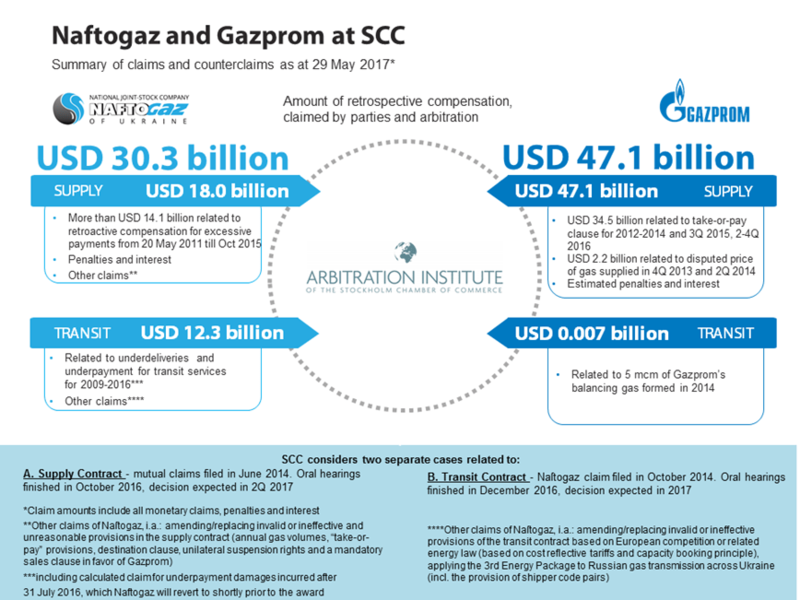 In December 2017, the Stockholm arbitration court revised the terms of the “take-or-pay” clause, obliging Naftogaz to only purchase 5 bcm of gas from Russia annually – a far cry from the initial 52 bcm/year. As well, it ruled Gazprom should cut its gas bill to Ukraine by 27,4% in accordance with market prices: from $485/1000 m³ to $352/1000 m³, starting from the second quarter of 2014. In result, the court obliged Naftogaz to pay Gazprom $2 bn in arrears, much less than the $56 bn the Russian gas monopolist had sought. Both sides accepted this verdict. Then, on 28 February 2018, the same court ruled in favor of Naftogaz once again, deciding that Gazprom under-delivered transit gas to Ukraine, which cost Naftogaz $4.63 bn. However, it declined Ukraine’s claim to raise transit prices. After accounting for Ukraine’s arrears from 2014, Gazprom now owes Naftogaz a total of $2.56 bn – which, however, is a fragment of the $37 bn which Naftogaz had sought. This time, Gazprom vocally disagreed, returned Naftogaz’s prepayment, and cut off supplies. Didn’t Ukraine stop buying gas from Russia because of the war in Donbas? Ukraine did stop buying the Russian gas from Gazprom back in 2015, buying it from European companies instead. But the ruling of the Stockholm arbitration court obliged Ukraine to renew buying gas from Gazprom according to the current contract – though, in much smaller volumes than Moscow demanded, according to its needs, and at lower prices. This supply had to start on 1 March 2018, when Gazprom suddenly refused to perform the contract and returned the prepayment. What’s happening now, is everyone freezing in Ukraine? Nope. Despite the gas supply being cut off during abnormal frosts, Ukrainians managed to drop the daily gas consumption by 14%. Such a dramatic drop was the result of the popular support of Naftogaz and President Poroshenko’s initiative #Prykruty (“turn [the gas] down!”), and of the emergency measures by the Ukrainian government. Kyiv had ordered power companies to replace gas with alternative fuels where possible, temporarily close schools and universities, and ask industrial enterprises to revise their plans in order to save energy. But now the weather is warmer and Ukraine managed to make up the deficit by purchasing gas from Poland, signing a contract with the Polish state company PGNiG. Is Ukraine dependent on Russian gas now? It was before Russia occupied Crimea and orchestrated a war in Donbas in 2014, but that changed. Now, Ukrainian domestic natural gas production covers some 60% of its total consumption, which stands at around 32 bcm/year. Ukraine still remains dependent on natural gas of Russian origin, but not on Russian supplies. Starting from 2015, Ukraine purchased gas exclusively from EU companies. Although 30-40% of this EU gas comes from Russia, at least this scheme allows avoiding political blackmail. Today, domestic production, imports from the EU, and Ukraine’s huge subterranean storage facilities provide the country with a balanced consumption of gas. In 2017, Ukrainian domestic production was 20.5 bcm with the consumption of 31.9 bcm, while 14.1 bcm were imported from Europe. The government plans to increase gas production up to 35 bcm and lower the consumption to 30 bcm by 2035 to export annually 5 bcm of natural gas. Why was there a shortage then in March? The Stockholm arbitration court obliged Ukraine to renew gas imports from Russia, and Ukraine prepaid for the volumes it expected Russia to supply, relying on them, but Russia refused to supply gas according to the ruling of the Court and returned the prepayment. Although Ukraine had enough gas in underground storages to make up for the lost volumes, it’s difficult to quickly extract it and transfer within the national pipeline system to consumers. Moreover, at the end of the heating season, when the supply is nearly exhausted, the underground pressure drops and the gas extraction rate decreases with it. Imagine a beach ball – if it’s pumped up to a maximum pressure, the air will be released faster from its valve than if it’s half deflated. The March-2018 withdrawal rate was a maximum of 115 million m³ a day. The problem was made even worse by Gazprom’s maintenance of the lowest available pressure at the entrance to Ukraine’s gas transport system throughout the entire winter of 2017-2018. The contracted figures range between 60 and 65 kilogram-force (kgF) per cm², the de-facto pressure was 51-59kgF/cm². And starting from 1 March, Gazprom reduced pressure to the lowest value this year, 50,3kgF/cm². So this isn’t the first time Gazprom is doing this? Oh yes. Gas blackmail like this was (and still is) an element of Russian foreign policy and a “political weapon” to either keep its neighboring countries in Russia’s orbit or at least to influence them. Since Ukrainian independence in 1991, Russia temporarily suspended its gas pressure on Ukraine only during the presidency of Viktor Yanukovych (2010-2014), the pro-Russian president ousted by the Euromaidan in early 2014. Russia suspended gas exports several times between 1992 and 1994 as a result of disputes over non-payments by Ukraine. In 1993, then Russian President Boris Yeltsin offered to annul Ukraine’s gas debt to Ukrainian president Leonid Kravchuk in return for control over the Black Sea fleet and Ukraine’s nuclear warheads. Kravchuk could have agreed, but a strong rebuke from politicians in Kyiv made him abandon the idea. In 1994, a Ukrainian deputy prime minister agreed with Russia that Gazprom could acquire a 51% stake in the pipeline system. However, in 1995, the Verkhovna Rada adopted a law prohibiting the privatization of oil and gas assets. In 1998, Gazprom alleged that Ukraine had illegally diverted gas meant for export to other European countries and suspended exports of oil and electricity to the country in 1999. Gazprom also claimed that Ukraine’s debt had reached $2.8 bn. The debt issue was settled only in 2001, by the signing of an intergovernmental gas transit agreement. In 2005 as the Orange Revolution disrupted Russia’s plans for the Ukrainian presidency of pro-Russian Viktor Yanukovych, Russia trebled the gas price for Ukraine. The Ukrainian government accepted the Russian demand with the stipulation that price increases were to be gradual. Later in 2005, Gazprom stated that 7.8 bcm of its gas deposited in Ukrainian storage reservoirs was not available. It remained unclear if it was missing, had disappeared due to technical problems, or had been stolen. As the negotiations between Gazprom and Naftogaz over prices and a new gas supply agreement failed, Gazprom started reducing the pressure in the pipelines from Russia to Ukraine on 1 January 2006. A number of European countries saw a drop in their supplies as well. The supply was restored on 4 January 2006, after the preliminary agreement between Ukraine and Gazprom was settled. In January 2008, Gazprom threatened it would reduce supplies to Ukraine if $1.5 bn in gas debts were not paid. Gas wasn’t cut off then and Ukraine claimed that the debt was paid. Later in February 2008, Gazprom claimed that Ukraine didn’t pay a $600 mn bill, stating that Russia supplied its own gas instead of cheaper Central Asian gas for several months. Ukraine disagreed with Russia’s claims and on 3 March 2008, Gazprom claimed that the $1.5 billion debt still was not paid and cut the shipments to Ukraine by 25%, and an additional 25% the next day. The supplies were restored on 5 March. At the end of 2008, Gazprom and Naftogaz were not able to agree on the price for 2009 and Russia completely halted natural gas exports to Ukraine on 1 January 2009, while continuing shipments intended for the EU. On the next day, the pressure in the EU pipelines dropped too. 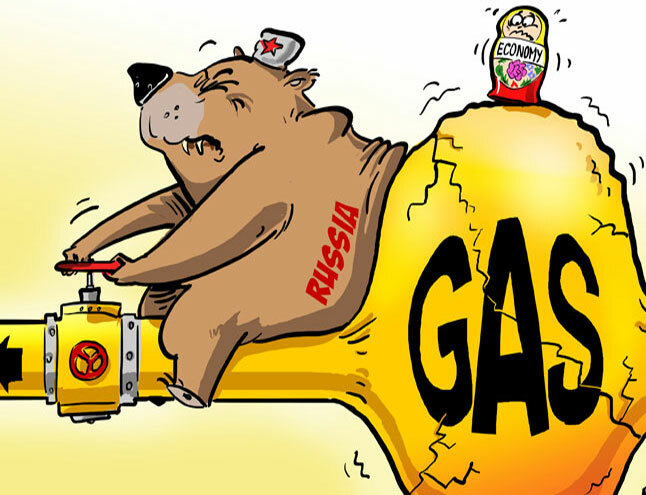 On 7 January, Russia cut off all gas exports via Ukraine and several countries reported a major fall in supplies. Bulgaria, Moldova, and Slovakia were among the most affected by the drops. Russia restarted supply only on 20-21 January 2009, after then Ukrainian PM Yulia Tymoshenko signed unfavorable contracts to buy gas at European market prices starting from 2009 while Ukraine agreed to keep its transit fee for Russian gas unchanged in 2009. Several days after Russia initiated the crisis, Gazprom and RosUkrEnergo (Swiss-registered Turkmenistan gas supplier owned by Gazprom and Ukrainian oligarch Dmytro Firtash, a straw firm to supply Russian gas to Ukraine) filed lawsuits against Naftogaz in Stockholm arbitration court and later won $200 mn as a penalty as well as the return of 12.1 bcm of natural gas for breaches of contracts. Again, as usual, Russia also accused Ukraine of illegal diversion of natural gas, however, these accusations were not confirmed. In 2010, pro-Russian Ukrainian president Viktor Yanukovych signed the infamous Kharkiv Pact with Russia, which stipulated a 30% drop in the price of gas in exchange for permission to extend Russia’s lease of a major naval base in the Ukrainian Black Sea port of Sevastopol (Crimea) for an additional 25 years with an additional five-year renewal option (to 2042-47). In March 2014 amid the Russian invasion of Crimea and its further annexation, Russia seized Ukrainian assets in Crimea, including the oil and gas company Chornomornaftogaz, a subsidiary of Ukraine’s state-owned Naftogaz. In April 2014, the U.S. Treasury imposed sanctions on Chornomorsknaftogaz, so later did the EU. Formally, Gazprom has no dealings with the seized company to avoid facing sanctions itself, but Chornomorsknaftogaz continues to illegally extract gas on the fields of Ukraine’s occupied Crimea. In March 2014, having annexed Crimea, Russia denounced the 2010 Kharkiv Pact and its 30% gas discount. Later in June 2014, Gazprom stated that Ukraine’s debt to the company was $4.5 bn. Unilaterally Gazprom decided that Ukraine had to pay upfront, and completely halted gas supplies to Ukraine. This instance of blackmail accompanied the direct invasion of Russian regular troops in the East-Ukrainian region of the Donbas. The Russian regulars came support the irregular formations which were losing battles to Ukrainian forces. Russia agreed to resume gas supply only in October 2014, after the peace deal known as the Minsk Protocol was signed by the representatives of Ukraine and Russia. In November 2015, Gazprom halted its exports of gas to Ukraine because Ukraine had stopped buying it. Naftogaz and Gazprom filed lawsuits to the Stockholm arbitration court. In February 2018, Naftogas won the epic four-year legal battle in Stockholm. In retaliation, on 1 March Gazprom tried to provoke another gas crisis in the EU and to blame Ukraine in what Putin calls “snatching gas,” as Russia did in 2006 and 2009. However, Ukraine is not that gas dependent anymore, and Ukrainians, having lowered the daily gas consumption by 14%, saved the uninterrupted gas supply to the European Union. As a result, Gazprom itself shot in the foot, having given Ukraine grounds for further lawsuits against itself. But doesn’t Gazprom understand that this harms their international reputation? It does, but in this case, Gazprom’s actions were politically motivated. However, commercial intentions can’t be ruled out. Gazprom could have halted gas supplies to Ukraine in order to cause drops of pressure in the EU, as Gazprom succeeded in 2006 and 2009, and later to sue Ukraine as in 2009. German energy expert Claudia Kemfert commented to DW on the current Russian attempt to instigate another gas crisis, “There are certainly also political motives here. Gas is once again being used as a political weapon. We have been seeing this for many years,” she said. It’s not so hard to guess what enraged Russia. Just a day before the cut-off, on 28 February 2018, Naftogaz won the lawsuit against Gazprom in the Stockholm arbitration court regarding the Russia-Ukraine contract on transit, as a result of which Gazprom was obliged to pay Naftogaz $2.56 bn. Gazprom announced it disagrees with the Stockholm court’s ruling and on 1 March 2018, Gazprom’s deputy head, Alexander Medvedev that Gazprom was not going to resume gas deliveries to Ukraine and returned a prepayment. Meanwhile, Gazprom CEO Alexei Miller claimed that the Stockholm court was guided by double standards. On 5 March 2018, Miller announced Gazprom was preparing to terminate the 2009 contract with Naftogaz. Can Gazprom actually ignore the court decision? According to Ukrainian lawyer Roman Marchenko who one time served as an arbitrator at the Stockholm court, Russia and its state-owned Gazprom often take up the position when they take part in arbitration sessions, then even challenge these decisions, but don’t carry them out: “The most striking example is, naturally, the classical situation with Yukos. This is a standard position, so it’s extremely likely that there will be attempts to not implement the decision,” he told, referring to the time when Russia appealed to the arbitration court in The Hague. Economic expert Yevhen Oleinykov also mentioned the case of the Noga company, when Russia effectively ignored the decision of the Stockholm arbitration court. On 6 March 2018, Gazprom announced it appealed the decision of the court in the gas supply case and expects to submit an appeal in the gas transit case by the end of March. But what is the likelihood of this appeal being successful? Marchenko says, citing the New York convention of 1958, that such international arbitration decisions can be appealed in a limited number of cases, when formal reasons are involved, such as a side not being able to participate in the session. Therefore, the theoretical possibility of the decision being canceled exists, but it is small. Regarding how the decision can be implemented, Ukrainian President Poroshenko said that Ukraine will aim to arrest Gazprom’s assets in Ukraine and seize its foreign assets. However, Marchenko notes that such actions take a long time and require efforts, as each country has its own procedures for such seizures. Meanwhile, Naftogaz’s commercial director Yuriy Vitrenko said that even if Gazprom will appeal the Stockholm Court’s decision, it is still effective starting from 1 March, which means that Gazprom will be additionally fined $500,000 daily until it repays the debt. It is unclear what will happen next. Can this blackmail repeat again? Is the EU under threat? Moscow’s reaction to the Stockholm verdict shows that Russia can attempt to repeat gas blackmail anytime in the future. This latest attempt, unlike those in the previous decades, when Ukraine was extremely dependent on Gazprom’s gas, was unsuccessful partially because post-Maidan Ukraine had been pursuing an energy independence policy. However, if Russia would fully halt supplies to the EU via Ukraine, Ukraine wouldn’t be able to cover the EU demand for gas using its own supply and production. Another threat to the EU may be posed by the Nord Stream 2 gas pipeline, poised to connect Russia directly with Germany bypassing the Ukrainian gas transport system. As the speakers of the parliaments of Ukraine, Moldova, Poland, Lithuania, and Latvia warn parliamentarians of the EU countries, Nord Stream 2 may only increase Europe’s energy dependence on Russia. The speakers insist that Nord Stream 2 is, in fact, a political instrument of Russia despite the fact that it has been presented as a commercial project. Text: Yuri Zoria, with contributions by Alya Shandra. This FAQ was inspired by Serhiy Lukyanchuk’s article on texty.org.ua.